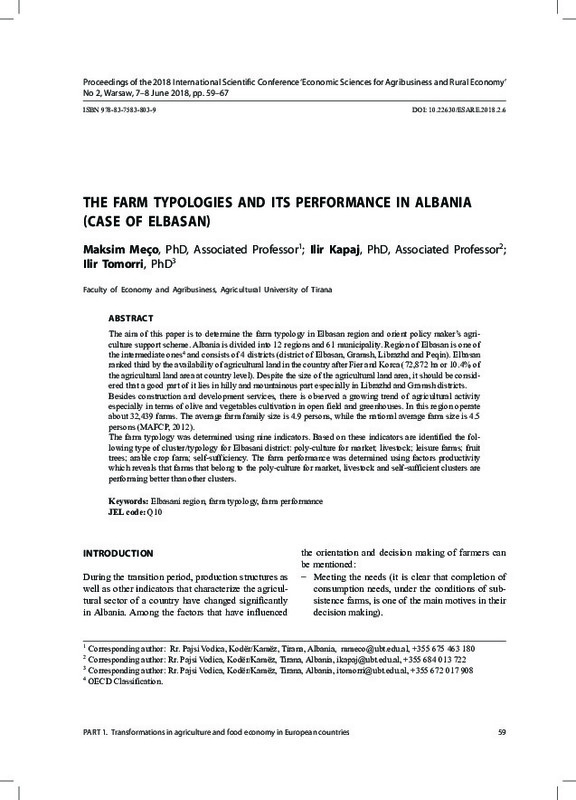 The aim of this paper is to determine the farm typology in Elbasan region and orient policy maker’s agriculture support scheme. Albania is divided into 12 regions and 61 municipality. Region of Elbasan is one of the intermediate ones4 and consists of 4 districts (district of Elbasan, Gramsh, Librazhd and Peqin). Elbasan ranked third by the availability of agricultural land in the country after Fier and Korca (72,872 ha or 10.4% of the agricultural land area at country level). Despite the size of the agricultural land area, it should be considered that a good part of it lies in hilly and mountainous part especially in Librazhd and Gramsh districts. Besides construction and development services, there is observed a growing trend of agricultural activity especially in terms of olive and vegetables cultivation in open field and greenhouses. In this region operate about 32,439 farms. The average farm family size is 4.9 persons, while the national average farm size is 4.5 persons (MAFCP, 2012). The farm typology was determined using nine indicators. Based on these indicators are identified the following type of cluster/typology for Elbasani district: poly-culture for market; livestock; leisure farms; fruit trees; arable crop farm; self-sufficiency. The farm performance was determined using factors productivity which reveals that farms that belong to the poly-culture for market, livestock and self-sufficient clusters are performing better than other clusters.